My love for the arts and the tropics was formed during the early years of my childhood. I had the privilege of living on the beautiful island of Oahu, Hawaii. My family and I lived in Kaneohe and spent many precious moments on the breathtaking beaches nearby: Bellows Beach, Kailua, and Lanikai. I remember my attraction to the turquoise colored ocean. I was always fascinated by the way the sun shines from behind a drifting cloud casting rays of light upon the water below creating different values and hues. Rainbows abound, and slow moving clouds of magnificent mass and form took on imaginary, whimsical shapes all reflecting the multicolor glow of the distant setting sun in the West. Island life is filled with natural visual wonders that fill me with awe. It is a place vibrating with life and energy from nature’s sweet breath. From the radiant glow cast by the sun and moon, to the backlight of a wave just about to crest and the sparkling light that dances on calm waters, these tranquil settings provide healing within and a connection to nature. I try to express in my paintings what the island experience means to me, heaven on earth. 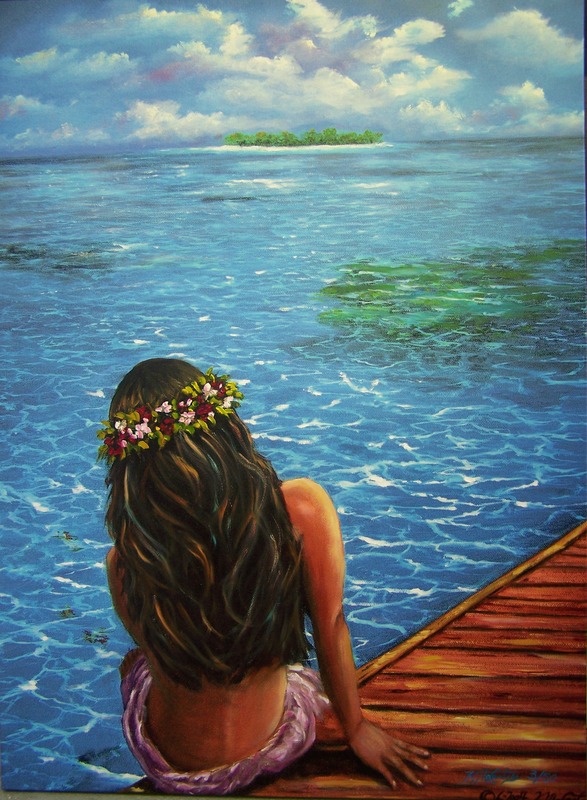 My paintings are inspired by my love of aloha. I desire to capture the tropical feeling from the pristine Hawaiian landscape to the South Pacific atolls. My aspiration is to capture the beauty of the land and the romance of the local people. This is a magical place. I make the time to create! It is my way of escaping the everyday life and to transcend to the ultimate peace. I hope the images I capture on canvas inspire the viewer to preserve the natural beauty of this planet, so we can continue to share and experience these natural treasures. Together let’s preserve the natural beauty we have in this world for future generations to come.